Rosa californica grows in the oak woodland, North exposures where there is some significant seasonal moisture and in full sun if it is almost swampy. Rosa californica spreads by underground runners and roots when it hits the ground. Rosa california can make a spiny thicket 4 feet tall and as wide as the California Wild Rose can find adequate moisture. Rosa californica is quite drought tolerant, but will lose its leaves if stressed. The late Spring flowers of Rosa californica are intensely fragrant. Rosa californica is Winter hardy to zone 5. Rosa californica is a larval food for the Mourning Cloak Butterfly, the Western Tussock Moth, and the Pale Tiger Swallowtail. 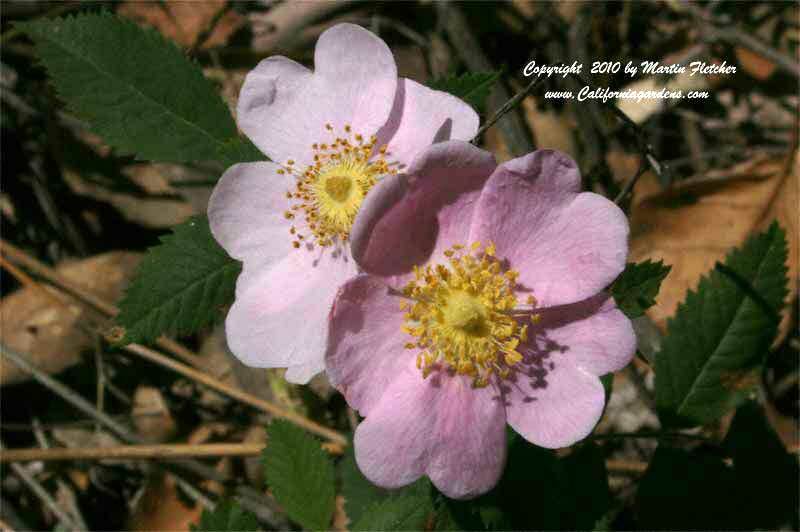 Pale pink flowers of Rosa californica - California Wild Rose. High resolution photos are part of our garden image collection.